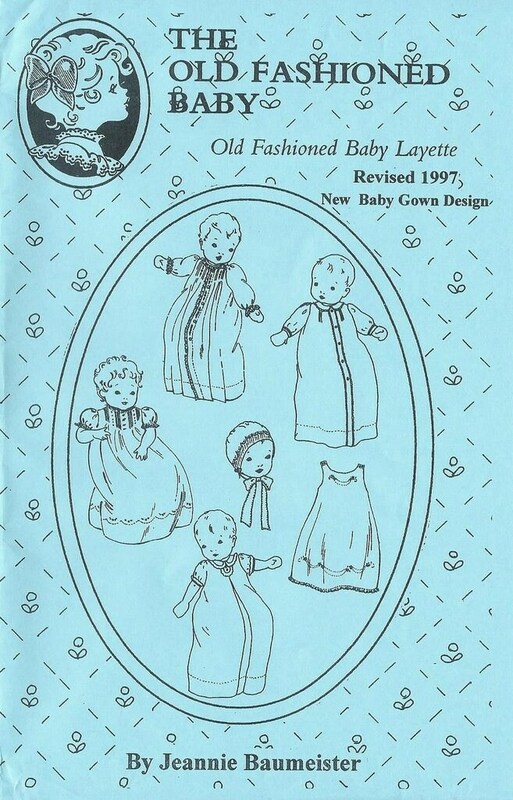 The Old Fashioned Baby Layette is very dainty and sure to inspire beautiful baby clothes. The pattern has been revised to include six sleeve styles on the exquisite Day gown. Embroidery designs are included The Bonnet also has a scalloped facing and embroidery. The NEW embroidery design is appropriate for the slip or gown. View 1 has tucks, embroidery, lace and long or short smacked sleeves. View 2 has a collar, front placket with tatting and long cuffed sleeves. Tucks are optional. View 3 buttons in the back and has a front pleat, ruffled cuffs, collar and front tab. The NEW French Day gown (View 4) has long or short puff sleeves gathered to a lace band or beading with entredeux and lace at the neck It is embellished with tucks and embroidery and features an optional Scalloped Hem. The Bonnet is lined and has fabric ties. The embroidered slip can be made long or short.